Your mind is the best tool you have for growing your business, hands down. It’s free. You always have access to it. It will never become obsolete (well, unless you stop learning and growing). And the best part is, you can improve it and “upgrade” it pretty much infinitely! And every time you do, the work you put in will pay off a thousand times over. So… care for an upgrade? It’s on me! 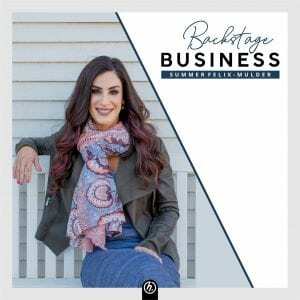 All you need to do is listen to this week’s Backstage Business podcast, where I talk to one of the best mindset coaches in the world — Regan Hillyer. …and create 6- and 7-figure brands in the process. Her work has helped launch thousands of successful businesses and impacted millions of people in life-changing ways. As a self-made multimillionaire by age 30, Regan is living proof that mastering your inner game is the most powerful investment anybody can make in their success. And I got to sit down with her and pick her brilliant brain for mind-expanding strategies that will help you grow your business — and overcome any other challenges you might be facing. We cover a lot of ground in this episode, from how Regan manages to run 8 successful companies at the same time, how she made the leap from offline to online business, how she conquers fear and self-doubt, and a lot more. So if you feel like hunting for specific insights and golden nuggets, I invite you to check out the show notes and see if anything catches your eye. And if not, just listen to the whole episode, it’s a stunner from start to finish! Please enjoy this conversation with Regan Hillyer — and if you liked this week’s interview, consider leaving a review on Apple Podcasts. Also, to make sure you catch the next week’s Backstage Business when it comes out, please subscribe to the show on Apple Podcasts, Stitcher, or wherever you get your podcasts. In this week’s interview, Regan Hillyer shares her approach to mastering the inner game of business, building products for different segments of her target market, her best marketing strategies, a dead-simple exercise she does to manage fear and self-doubt, and much more. Check the show notes for a full summary of what we cover in the episode!